Many biomedical applications require an efficient combination and localization of multiple light discrete light sources (e.g., fluorescence and absorbance imaging). We present a compact 6 channel combiner that couples the output of independent solid-state light sources into a single 400 µm diameter optical fiber. We demonstrate coupling efficiencies > 80% for each of the 6 laser diodes installed into the prototype. According to the development diagram, one beam combiner has lots of components, thus it would be very difficult to assemble with high coupling efficiency. To address this issue, we construct the semi-automatic optical alignment stage. The APD (avalanche photodiode) is a high sensitivity photodiode that operates at high gain by applying a reverse bias. 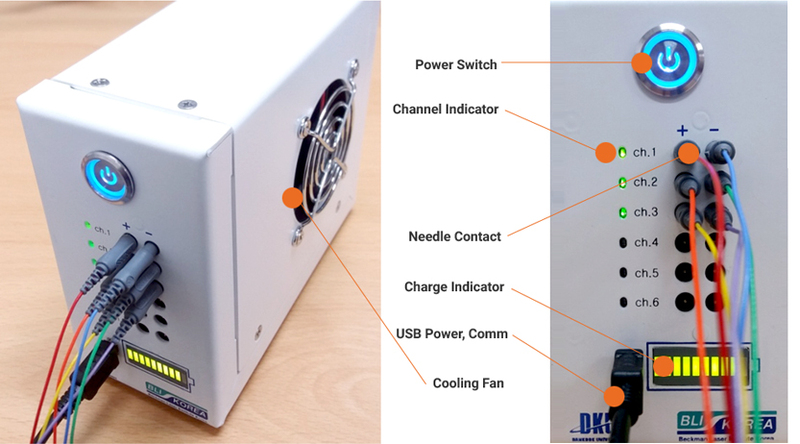 In order to ensure the constant gain of APD when temperature varies, the handpiece is equipped with high-speed type temperature-compensation bias algorithm. Once temperature sensors detect the change of temperature, the microcontroller starts to adjust the reverse voltage to make APD's gain constant.It is designed to ensure the stable operation of APD receiver over a wide temperature range without TEC(thermoelectric cooler) and is suitable for applications of the diffuse optical spectroscopy & imaging. Electromechanical Reshaping (EMR) provides a means of modifying the shape of cartilage. C²EMR is a 6-channel current source which is designed for needle-electrode-based current controlling Electromechanical Reshaping. The previous voltage controlled- EMR (vcEMR) incurs the severe pain due to high current during voltage application. However,the each channel of the C²EMR simply controls the current output, which delivers a stable and precision DC current ? up to 10mA with 0.1mA step to the cartilage. As a result, the developed C²EMR would be helpful to remove or reduce the pain. This fatmeta is a safe, affordable, and noninvasive approach to estimate subcutaneous fat thickness and metabolism by using a spatially resolved spectroscopy-based wearable sensing platform. In order to perform the simultaneous measurements at several distances,beam combinerwith different wavelengths are located at one end of a line followed by a series of photo diodes. Bluetooth Low Energy (BLE) are adopted as their primary communication protocol as a wireless communication. To obtain sufficient information for the separation of the scattering and absorbance properties, the proposed approach measures the light intensity of reflected beam at different distances from the incident light beam. Since the light intensities of reflected beam are measured at several distances, we can find the distinct points between the sallow penetration with low interaction in the tissue and the deep one with thehigh interaction. The structured light 3D system would be useful to obtain the digital coordinates of lesions, and then localize them for targeted phototherapy. A DLP projector is adopted to generate the structured light patterns and a camera is used to receive the digital images. In more detail, the projector and the camera operate togenerate patterns andcapture the patterned digital images sequentially. Finally, the 3D model is constructed by a depth calculation, a point cloud and a 3D polygon meshes in turn. With this 3D model, the therapeutic light is controlled to illuminate the targeted areas such as vitiligo, atopic dermatitis, psoriasis,neonatal jaundiceetc. Efficient charging of supercapacitors has receivedgrowing attention recently for subwatt-scale energy harvesting systems with supercapacitor-based energy storage. Supercapacitors, also known as ultracapacitors or electrochemicaldouble layer capacitors (EDLCs), have long lifecycles and high power density, but they cannot be used as a drop-in replacement for batteries. This research attempt to use the supercapacitors as an energy storage for subwatt-scale energy harvester by compensating for or overcomingtheir non-ideal behavior attributed to the discharge (voltage-vs.-energy) curve, substantial leakage currents, and charge redistribution. The proposed charging scheme enhances the charging efficiency of the harvestersby offsetting the leakage of the supercapacitor. Recent advances in low-cost remote monitoring systems have made it possible and practical to perform structural health monitoring (SHM) on a large scale. However, it is difficult for a single remote monitoring system to cover a wide range of SHM applications due to the amount of specialization required. For the remote monitoring system to be flexible, sustainable, and robust, this research introduces a new cost-effective, advanced remote monitoring and inspection system named DuraMote. The DuraMote effort started in 2008 as a NIST project. 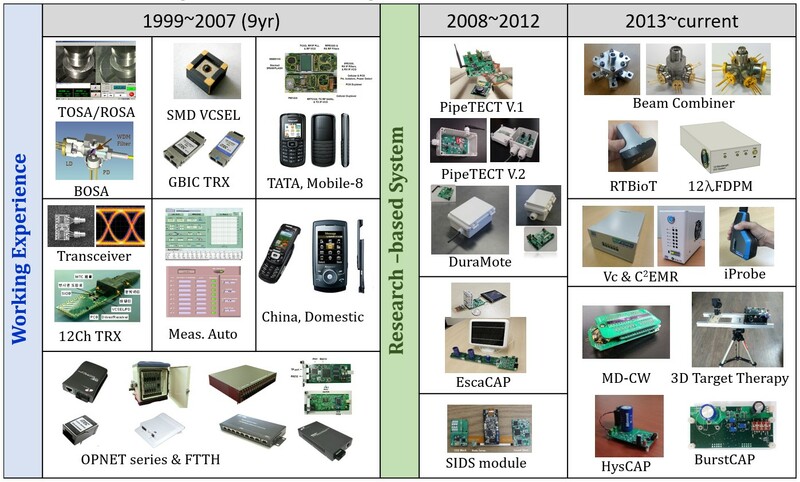 Funds was received in 2009 and the PipeTECT project was started.DuraMote uses Silicon Design's SD1221L-002 high-precision MEMS accelerometers in conjunction with a QuickFilter chip (4-channel ADC+digital signal conditioning). Its accelerometer performance has been extensively tested on a shaker for 0.1 Hz to 300 Hz vibration.As of September 2011, 100 units of DuraMote are being manufactured and tested. We have done field tests on the water pipes of OCSD (Orange County Sanitation District) in Newport Beach, IRWD (Irvine Ranch Water District) in Tustin, SAWPA (Santa Ana Watershed Project Authority) in Corona, PACE (Pacific Advanced Civil Engineering) in Costa Mesa, on Vincent Thomas Bridge in Long Beach, and the new Hwamyung Bridge in Korea.